Members are retired, but not necessarily grumpy or elderly. We meet at MCC on Tuesdays at 10:30am to discuss books chosen by the group. The first book we will discuss this coming season is How to Read the Bible and Still be Christian: Struggling with Divine Violence from Genesis through Revelation by John Dominic Crossan.Contact: Jim Eastman, 298-7155. The Morning Bible Study group meets the 2nd Tuesday of the month from 9:30-11am, at the MCC. We call ourselves the Judiths and we are a friendly group of around 8-10 women who enjoy stimulating discussion, a good cup of coffee and getting to know other MCC women better. Contact: Jean Loichinger, 836-1791. We meet the 2nd Friday of the month at 1:30pm at Oakwood Village University Woods in the Oaks Community Room, 6225 Mineral Point Rd. We are a group of women who meet each month to read and discuss a Bible study, share friendship and support one another. You are very welcome to visit us. Contact is Margaret Smith at 231-1496. This group meets every 4th Tuesday at 1:30pm at the MCC. Solve the World’s Problems With Us--One Cup of Coffee at a Time. This Breakfast Group meets 1st and 3rd Wednesdays starting at 7:00am. We have no agenda except to listen, learn and laugh with each other at the Hubbard Avenue Diner, Middleton. All are welcome. Contact: Sandra Esrael, sandraesrael@tds.net. Those are just a few of the things you will miss if you don’t get to the Hope men’s breakfast at the Original Pancake House on University Avenue, at 6:30am every Wednesday. Mondays, 7:15 am at the Lakefront on Langdon at the UW Memorial Union (Terrace). Good conversation, friendship, laughter and support. Contact: Ken Streit, 231-1525. Advent women are invited for coffee each Thursday at 7am at Panera Bread on University Ave. The only agenda is sharing friendship, and there is always laughter. We do service projects several times a year, pray for one another’s concerns, and celebrate joys. Contact: Karen Schwarz: 225-0026. We are a group of joyful MCC women who meet the 3rd Wednesday of the month from 6-9 pm in member’s homes for support, fellowship, food and fun. Our next gathering is on November 16 at Karen Kuhn’s home, 114 S Owen Dr, Madison. We will be discussing a service project for our December gathering. All are welcome! For more information, contact Karen at 231-6723. Begin your week with balance and peace of mind. We welcome all who’d like to join us in the Covenant Room, 5:30-6:30pm each Monday. We begin by listening to a brief “dharma talk” that explores different aspects of a meditation practice, then sit in mindfulness for about 20 minutes. Afterwards we may talk about our experiences (or not). Wear comfortable clothes and bring a pillow(s) or blanket. Namaste! Contact: Bob Sessions, 628-8610. The 55+ group meet the last Wednesday of the month, at noon, with a potluck at church. For information, contact Virginia Stumbo, Jan Robertson or Pat Eddings. This is an evening group for MCC women who seek to inspire and be inspired. We take turns hosting and read a book, article or passage ahead of time. We meet the 2nd Thursdays at 8 pm. For information and location, Contact: Kaisa Miller, kaisaumiller@gmail.com. All are welcome to attend Adult Discussion (formerly “Parent Hour”) the third Sunday of the month in the downstairs area. Anyone with interest in sharing the challenges and occasional triumphs of parenting is invited-- the group is accepting, and always has a robust discussion. Anyone with a commitment to our youth, regardless of parental status, is encouraged to join us! We are a mixed adult group that meets about twice a month for fellowship. We enjoy potlucks, outdoor activities (mostly summer) and outings to concerts, plays, museums and historical sites. We also sponsor the New Year’s Eve progressive dinner. Just come when an activity appeals to you. All ages are invited to our summer outdoor activities. Bring a snack to pass. Contact the church office for location. A group of MCC members gets together the 3rd Friday of each month to watch a film and then discuss its content. Movies we have watched together have included: Strangers in Good Company, Everybody’s Fine, The Last Temptation of Christ, Being There, Places in the Heart, Babette’s Feast and The Fisher King, and many more. The dates and locations of some films are yet to be determined. Film Group meets during the school year. Lois Komai, Coordinator. MCC Film Group Film Group has plans to meet up on Friday, September 15. Look for film and host in upcoming announcements. 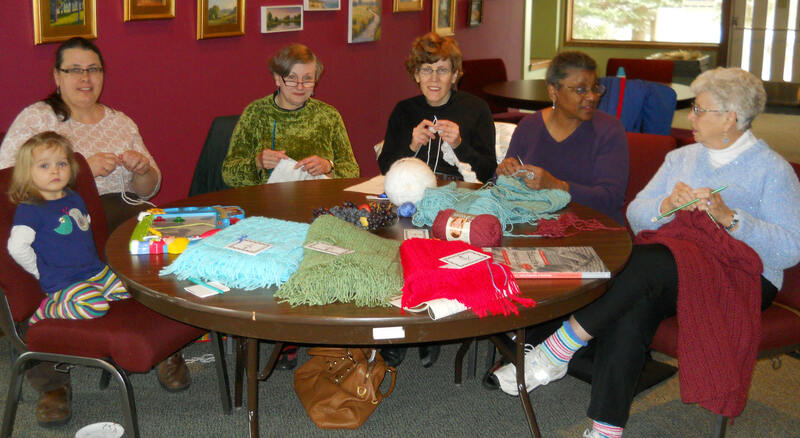 We welcome anyone interested in this ministry, experienced at knitting or crocheting, beginner, or anyone in-between. 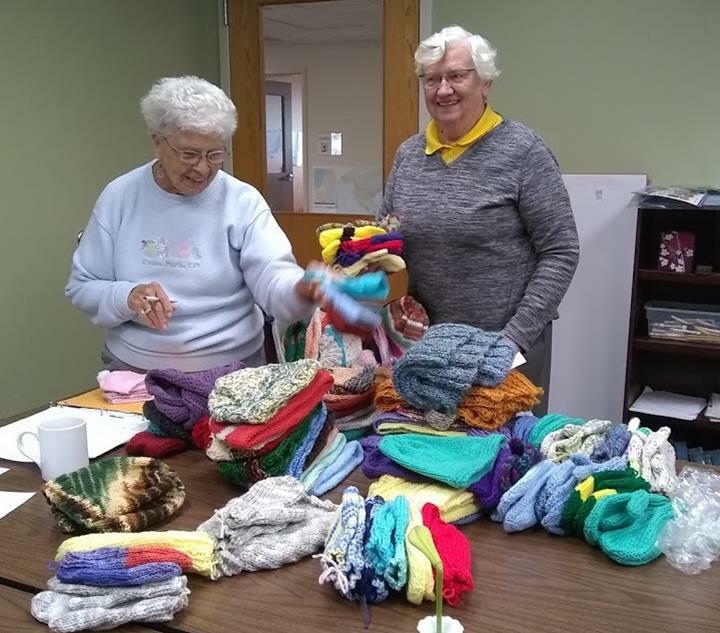 We make prayer shawls, hats, mittens, scarves and headbands. We meet the third Tuesday of each month at 10:30am at the MCC. Also—we accept any yarn you care to donate. Please mark your bags “PURLS” and leave by the guestbook table. Contact: Virginia Stumbo, 695-2266. We meet the first Tuesday of every month at 9am at MCC. The women in this group enjoy the fun of making warm and beautiful quilts for Lutheran World Relief. The quilters are taught everything they need to know and provided with any needed “tools.” If you can stay into the afternoon, we encourage you to bring a lunch. Contact Hildy McGown, 238-8670.